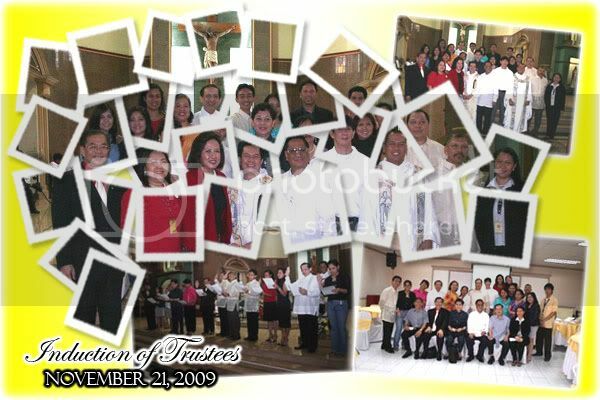 Last November 21, 2008, the UST-EHS General Alumni Association, Inc.’s newly elected Board of Trustees took their Oaths of Office, in an Induction Ceremony presided over by UST Vice-Rector Rev. Fr. Pablo T. Tiong, O.P. at the Santissimo Rosario Parish Church. The newly elected Trustees, led by their President Emmanuel German V. Plan II and Chairman Eduardo R. Umali, joined the Education High School family in having the institution’s Monthly Mass, concelebrated by EHS Regent Rev. Fr. Romulo V. Rodriguez, O.P., J.C.D. and Fr. Tiong. “It feels so good to be back home.” These were the words of President Plan after being inducted into office. Truly, it was a homecoming for the alumni of the Education High School who have been sent forth by their alma mater to shine in the world to which they now belong. Among the dignified guests in attendance were EHS Principal Assoc. Prof. Marishirl P. Tropicales, Office for Alumni Relations Director Prof. Evelyn A. Songco, Ph. D., Assistant Director Assoc. Prof. Maria Mercedes C. Buendia, UST-Alumni Association, Inc. President Ms. Laura Suarez Acuzar, and EHS Supervising & Regular Teachers. After the celebration ended at 10 a.m., the alumni and the guests proceeded to the Education High School Audio-Visual Room, where the festivities continued. Chairman Eduardo R. Umali delivered his message to the group, followed by the response of Ms. Laura Suarez Acuzar.